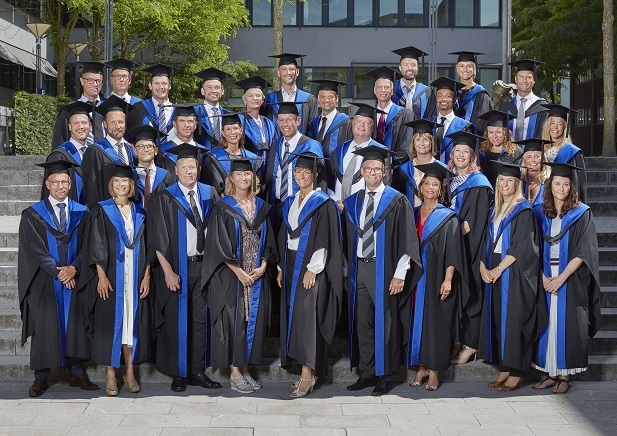 On Saturday 9 June 2018, the Executive MBA graduates donned their hats and gowns to receive their long-awaited and well-deserved diplomas. It was a proud and emotional moment for graduates and families alike as the two EMBA classes walked in procession onto the stage in Ovnhallen at Copenhagen Business School to take their seats. Gregor Halff went on to congratulate the MBAs on their new prestigious degree. CBS Professor and E-MBA Associate Dean Jesper Rangvid took on the joyous task of handing over the proof-of-degrees. “You belong to a select group of people that are willing to go that extra mile. To make an extra effort. That will be noticed and rewarded,” he said, addressing the two graduating classes. She also presented the winners of the Student-of-the-Class awards. This accolade went to one student from each class; Morten Knudsen (G-EMBA class) and Margrethe Wivel (E-MBA class). They had both been elected by their respected classmates for their extraordinary contributions in creating a positive learning environment. In his thank-you speech, Morten Knudsen honoured his fellow students and their commitment to making it a remarkable and worthwhile journey. “What surprised me most about this class was not the MBA and what we learned from our professors, but really what we learned from each other,” he said as he congratulated his fellow students on their MBA. “I think we made it because we took care of each other, helped each other and supported each other,” said Margrethe Wivel as she addressed her fellow E-MBA classmates and thanked them for a rewarding MBA journey.